Includes bearing and tool kit. (application dependent) These clutch kits are designed for use with SPEC flywheels or any aftermarket LS1/6 single mass flywheel, which bolt to the LS7 and offer a considerable reduction is rotating mass. These kits increase friction surface diameter to 12inches while reducing rotating mass by up to 36%. The SC57 flywheels are for use with non-stock clutch designs. 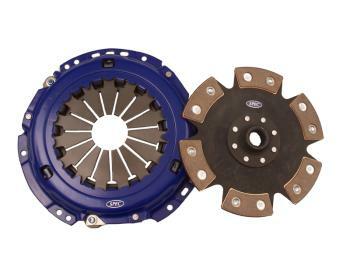 For a flywheel to be used with the OE style clutch, use pn SC66A-2 or SC66S-2. The package includes race bolt kit, pilot bearing and alignment tool. This application does not utilize a conventional throwout bearing, as the releaser is a concentric hydraulic slave/bearing assembly. This concentric slave is available as an option to the kit.